It is not advisable to analyse pure sulfur, as the vapour pressure may result in contamination of adjacent samples and discoloration of copper surfaces. Sulfur-containing self-assembled monolayers (SAMs) may be damaged by exposure to X-rays. Sulfur content is very low and typically requires long acquisition time for good quality S2p spectrum. For spatially uniform samples, minimize X-ray exposure per unit area by acquiring an array of well separated points (linescan or map) with very short acquisition times per point. Total acquisition time for array of points should be sufficient for good signal-to-noise when array is integrated into a single dataset. 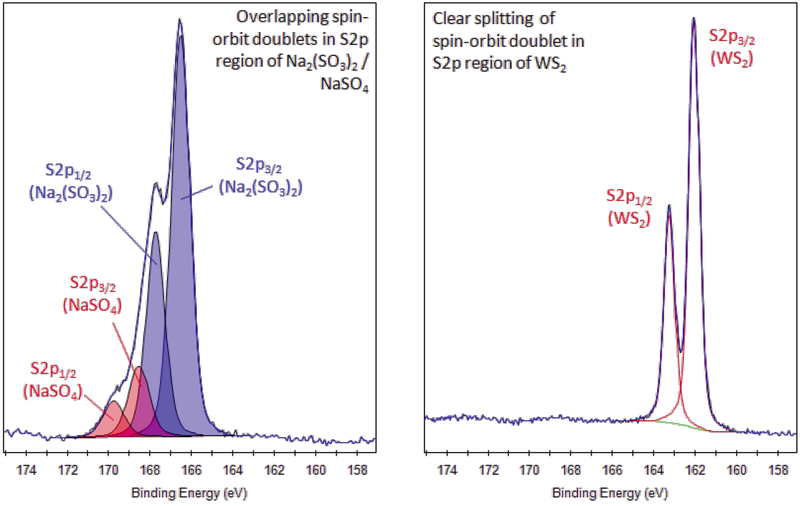 Effect of spin-orbit splitting can be observed for sulfur elements and compounds. The user typically observes either splitting between components or asymmetric peak shape due to unresolved doublet, depending on chemical state and/or instrument resolution. S2s peak, like S2p, shows large range of chemical shifts. 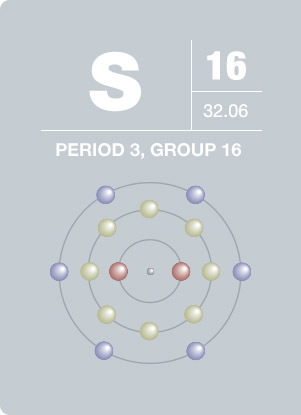 S2s peak has strong overlap with Se3s peak and Mo3d (particularly in sulfate/sulfonate chemical states, see Molybdenum section). As a minor component of fats, body fluids, and skeletal materials, this pale yellow element is essential to human life. Sulfur is found in meteorites, volcanoes, and hot springs. Even one of Jupiter’s moons owes it’s colors to various forms of sulfur. An important manufactured chemical, sulfuric acid, is produced using sulfur. Sulfuric acid is commonly known as battery acid. In high concentrations, hydrogen sulfide can cause death by means of respiratory paralysis, and sulfur dioxide is known to be one of the causes of acid rain and a dangerous component in air pollution.